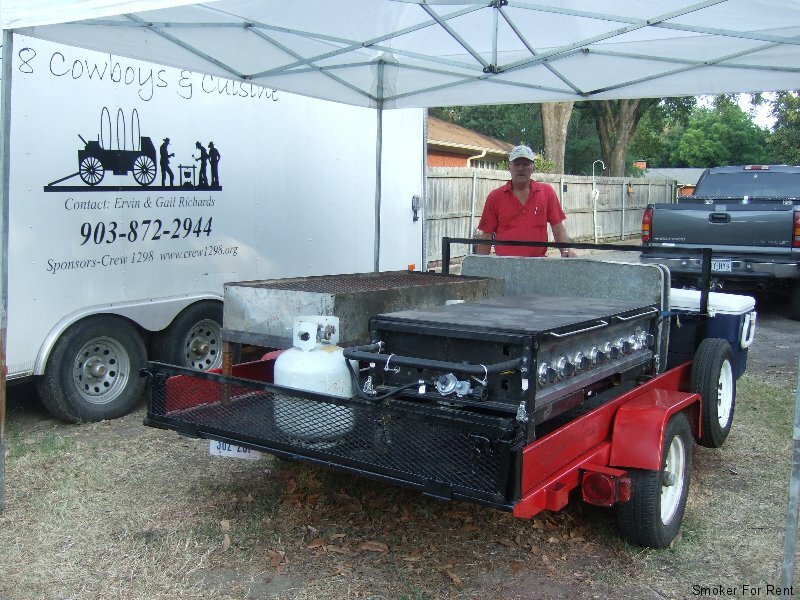 This trailer rents for $125.00 a day set up as pictured, with one 2X5 eight burner event cooker, propane fuel and one 2 X 5 charcoal fueled grill for those who prefer the charcoal flavor. Each will hold around 40 10 oz rib eyes and cook to perfection around 12 to 14 minutes. Extras can include a 6 basket 18 gal grease fish fryer and replace the 2 cookers on front with 2 food warmers that accommodate full cooking sheets, both of these can be set up as hot or cold boxes, extra changes will apply. This trailer pulls great behind a small SUV. It is a perfect set up complete with a 12 X 12 canopy and 2 tables. Perfect for tailgating parties at the game, backyard parties or the lake. Copyright © Smoker For Rent. All Rights Reserved.